What to do on Valentines Day & a GIVEAWAY! Valentines Day is only four days away so I thought I’d put up a series of posts to get you in the mood for the day of love. I’ll openly admit that I love celebrating Valentines Day. The cynics amongst us say that it’s a day for card shops to make their money but I disagree. I tell Mr WLL, my family and friends that I love them everyday, I’m mushy like that you see, but for one day of the year I think it’s really nice to show your special someone how much you love them. Now I’m not just talking about gifts which I’ll come to tomorrow, I’m talking about giving them one of the greatest gifts of all- your time. Spending time with them and enjoying yourselves. Mr WLL and I have spent many happy Valentines days together so I have a backlog of ideas of how you could spend the day and I thought I’d share some of my ideas with you all. I’ve tried to include activities for different budgets, etc so I’m sure there’ll be something here that you’ll enjoy doing. Whether you’re single or in a relationship this Valentines, do spend it with those you love as these activities can be enjoyed with your partner or with friends and family. If you and your partner love to be pampered then I would really recommend going to a spa for the day. 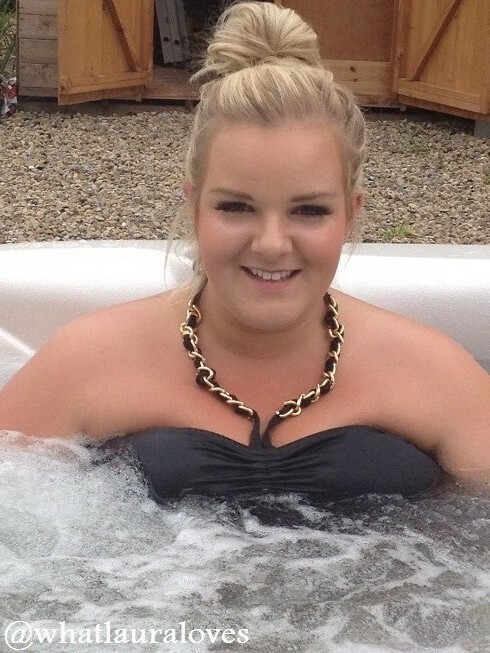 We go to spas a couple of times a year whether it is when we’re on holiday or for a break away in the UK. A lot of places offer special deals around Valentines Day where you can get a couples massage and an overnight stay included so I’d definitely recommend checking out some country house hotels and alike. Now boys, if you’re whisking your lovely lady away for a spa break then might I suggest picking up some cute swimwear for her as a gift? I’ve just bought this cute heart print tankini from the brand Resort at Very. It’s quite a cute fifties pin up style with a red background and white hearts on it and it has a blue and white striped frill along the bust and the top of the briefs. Very cute and perfect for a valentines spa day. If you love the idea of a spa break but perhaps cannot get the time off work or cannot stretch to the cost that some of these hotels charge then an at home spa is a fantastic option. Mr WLL often does this for me, especially after a hard day at work. Run a nice hot bath for your other half, pop some bubble bath in or a bath bomb from Lush (they release some great ones at this time of year) and light a few candles- my favourites are the tin candles from Bomb Cosmetics. Put out some of their favourite pampering products- body scrub, body wash, a hair mask (see yesterdays post for some ideas there), face mask and their favourite shampoo and conditioner, whether you’ve bought them or you’ve put out the ones they already had, they’ll certainly appreciate the gesture and the time you’ve taken to select them and put them out. If you’ve got a bath that’s big enough, you could even take a bath with your partner. We have a big two person jacuzzi tub which is really relaxing when the jets are on. I suppose going for a meal out can be as expensive as you would like to make it but I think it is safe to say that dining out on Valentines Day can be a memorable experience. A candlelit meal for two in an upmarket restaurant with good food, good wine and good service is a classic and safe bet choice for Valentines Day. Many restaurants do special set menus for Valentines Day too. If you’re living in London then I’d really recommend checking out Rosie’s blog. She writes a lifestyle blog called The Londoner and she has a back catalogue full of fantastic restaurants to go to. If you’re in the North East however, then I’d really recommend The Blacksmiths Table Restaurant in Washington for something a little different or Romanos in Cleadon which is a high class take on Italian cuisine. My budget option for those who are looking for a less extravagant option or who would rather eat at home in their comfy clothes (lets face it, who doesn’t like to let it all hang out after a big meal?! ), is quite literally a takeaway and a bottle of wine. This is what Mr WLL and I have done this year for our Valentines night as he is working away on Valentines Day itself so we celebrated early. We lit some candles on the coffee table, ordered food from our favourite Chinese, opened a bottle of White Zinfandel and snuggled on the sofa watching a film. Of course a night in can be made more formal, eating at the dinner table for a start but we wanted something more chilled out. I even wore my new PJs from Lipsy which are perfect for Valentines Day as they’re covered in hearts. The Harry Potter Studio Tour is something I’ve always wanted to go to and when we get some time off work, Mr WLL and I are definitely going to go. I think this would make the best Valentines Day treat ever but perhaps that’s because I love Harry Potter. Booking is a must for this one so if you want to go then I’d check out their website pretty fast! Now some of you may be wondering why I’ve included a cinema date as the pricey option for film buffs. Well, have you seen the price of the cinema lately?! Mr WLL and I go to Cineworld where we pay £14.99 a month each to see unlimited films which is worth it, when you go as many times as we do but the cost of a single adult ticket at the cinema is quite hefty on it’s own and that’s before you’ve bought your snacks or chosen to see a 3D film. So I guess what I’m saying is that I am concious that not everyone wants to be spending £16 on two cinema tickets but if you do then I think a cinema date is a great option. It’s somewhere you can get dressed smartly but still comfortably so if you’ve been together a while it will still make you feel special getting dressed up to go out and as though you’ve made the effort. The film that’s out at the moment that I’d really recommend for a Valentines Day date would be I Give It A Year which is a romantic comedy and perfect for the occasion. A couple of tickets, a drink and some popcorn to share will cost you around £25 but money well spent in my eyes as I love going to the pictures. If you’re a film lover like me but you’re on a budget then look no further than the at home cinema experience. Creating this is easy and doesn’t require a lot of money. Simply pop on a DVD, put out some of your favourite snacks and press play. If you want to watch a film that you don’t have in your collection or if you’re looking for the latest released then you can even watch movies online at home with companies like Blinkbox. Blinkbox is an online movie streaming service that allows you to rent or buy movies and TV shows without having to commit to a monthly subscription. This means that you can pay for what you want to watch when you want to watch it and you can enjoy it wherever you want, whether that’s on your Smart TV, Tablet, Games Console or on your computer. 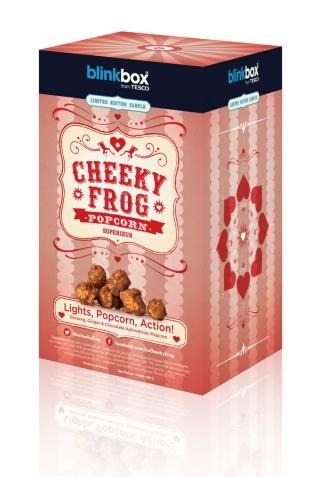 Blinkbox are a part of Tesco and they have recently joined forces with gourmet French popcorn brand,Cheeky Frog, to create an aphrodisiac popcorn which is a limited edition offering for Valentines Day. The taste is a combination of chocolate, ginger and ginseng which claim to have aphrodisiac properties. Fancy giving it a try? Leave a comment telling me who you would share your popcorn with if you won and why, together with your twitter name and email address in the box below. The contest will run until Valentines Day, Thursday 14th February 2013 at 8pm GMT. The winner will be chosen at random. I’ll post the winner on this post and I’ll email them to let them know they have won and providing I have their details, their prize will be sent out on Friday ready for the weekend. This contest is open to the UK only but for those internationally, don’t worry as I have a giveaway coming up soon that will be open for everyone.